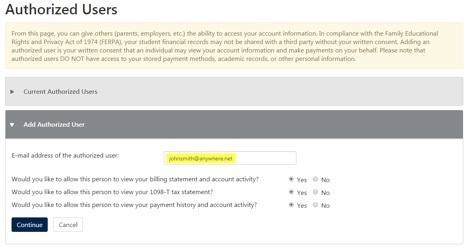 Setting up an authorized user allows for a person you specify to have access to your TouchNet account to view bills, make payments and deposits, view your 1098T form etc. Please note that this does not give your authorized user the capability to request account specific information when calling our office. 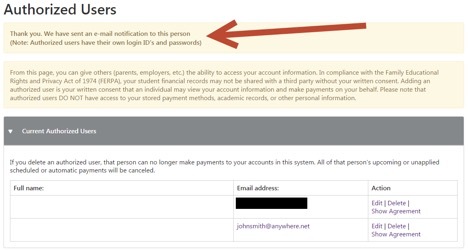 Please be sure to also add your authorized user to your FERPA release in Banner Self-Service to ensure that we are able to provide account information if they wish to contact our office. Once in your account, click on Authorized Users at the top of the screen. Press continue once you provide their email address and make your selections. Please be sure to read through the agreement shown to you, click I Agree, and then press Continue. A confirmation message with then appear at the top of the screen. 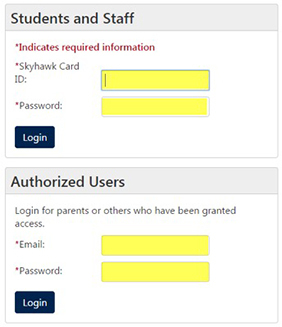 An email will be sent to your authorized user with instructions on how to log in and view information. 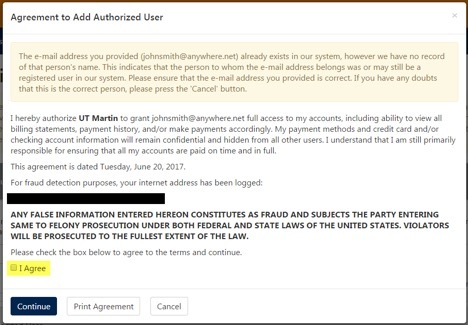 The email address that you authorized will now appear in the Current Authorized Users section.